CR Electronic Design manufacture an exciting range of audio products specifically aimed at the connoisseur. Research, design, development and first class manufacturing facilities are the cornerstone of the company's success. The Carmenta tube pre-amplifier complements the established range of integrated power amplifiers and offers the user greater flexibility when trying to build and balance a system. When Carmenta was being designed, great emphasis was placed on product transparency and all circuitry was developed with this in mind. Carmenta will match perfectly with most products in the CR range and although originally intended for use with the Amphion and Remus power amplifiers, it will work well with integrated amplifiers using the auxiliary input thus adding all the facilities of this pre-amplifier. As with all the CR pre-amplifiers, flexibility has been incorporated where it does not compromise audio excellence. Therefore, users will find the Carmenta pre-amplifier will match beautifully with our transistor amplifiers, challenging pre-conceptions and making an excellent hybrid combination; perhaps finding the best in both valve and transistor technology. 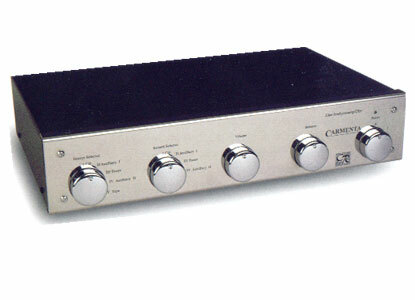 Appearance is especially tailored to match the CR range of amplifiers. High lustre stainless steel and black being assured. Attention to external cosmetics and detail are always important and final quality checks on Carmenta ensure these are always perfect.